When Bala and Shalaka told me about this recipe - I was very skeptical about the taste.. I thought this would taste strange - raisins and peppers?? I made these for my Mausi's 70th Bday party and everyone just loved the dish... I hope you do too..
Soak the raisins for an hour so that they are tender. Blend the cashew nuts and raisins till you get a coarse sticky mixture. Add garam masala, coriander and cumin powder, salt to this mixture. Mix well - Add besan and mix well again. Add just a little bit (about 1 spoonful) water so that all the ingredients come together..
Stuff the Italian peppers with this mixture just like bharavan bhindi or baingan. But don't add too much stuffing since the stuffing is quite heavy. 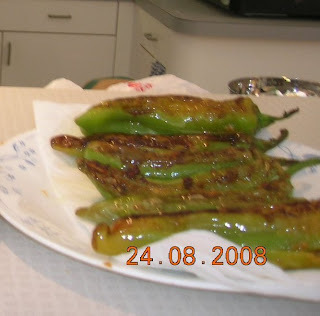 The stuffing in this case is more like a layer or lining from inside the pepper..
Heat about 4 tbsp oil in a pan and shallow fry the stuffed peppers till they become golden brown as shown in the photo.